This is the Thunderbird GSoC project that I am doing in summer 2017. It hosts all the React equivalent of XUL dialogs that I have converted. This webapp also has an iframe-testing-ground where user can pass custom dialog data and see the resulting dialog. This project should be viewed ONLY IN FIREFOX BROWSER because it uses firefox platform css. 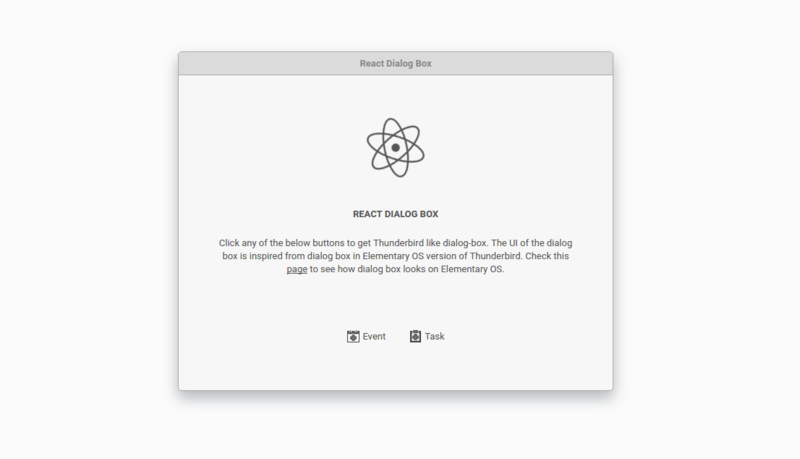 React implementation of Thunderbird's XUL dialog box. This was the working prototype that got me selected for Mozilla's Convert XUL to HTML(React) project in GSoC 2017. A beautiful app for trading items. User can add items, make proposal and accept/decline trade request for their own items. 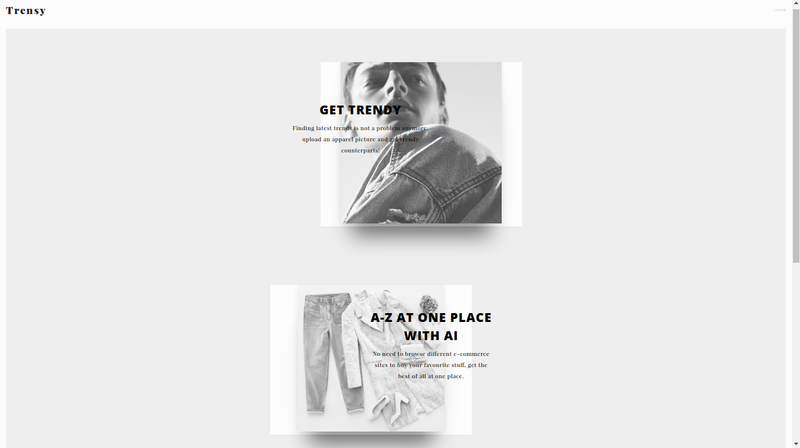 A beautiful e-commerce template with flat design powered by react, redux and many other modern web development tools. 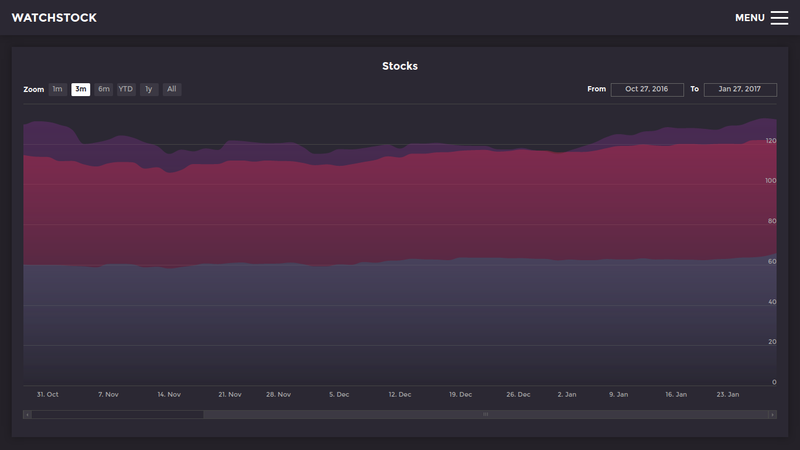 WatchStock is full stack MERN web app where user can view a graph displaying the recent trend lines for each added stock. User can add new stocks by their symbol name and can remove stocks as well. User will see changes in real-time when any other user adds or removes a stock. 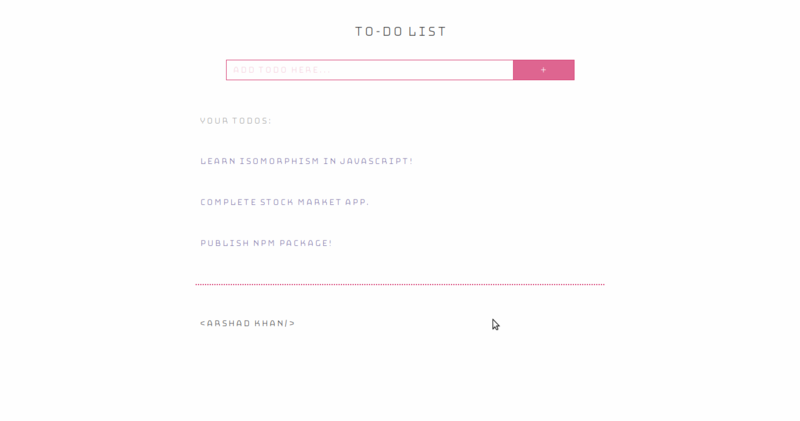 Todo List App is simple react app that creates todos and stores them in localStorage. A simple pie chart made by using D3.js, representing area percentage of continents of world. User can submit a form-data object that includes a file upload. When user submit something, user will receive the file size in bytes within the JSON response. User can get the image URLs, alt text and page urls for a set of images relating to a given search string. User can paginate through the responses by adding an offset parameter to the URL and user can get a list of the most recently submitted search strings. 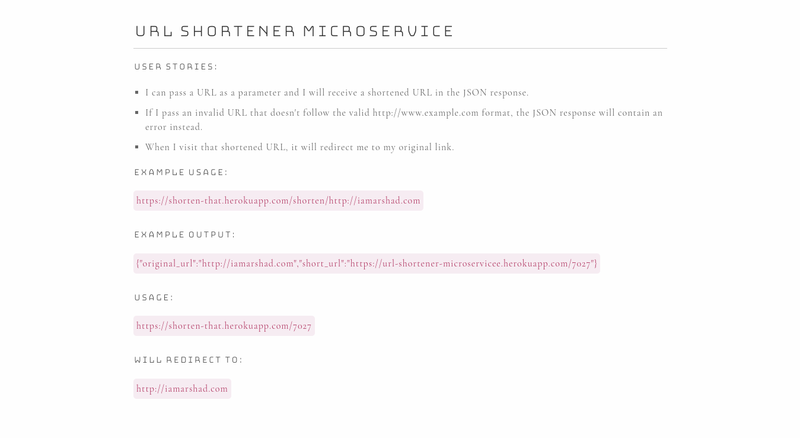 User can pass a URL as a parameter and will receive a shortened URL in the JSON response. If user pass an invalid URL that doesn't follow the valid http://www.example.com format, the JSON response will contain an error instead. When user visit that shortened URL, it will redirect user to original link. User can get the IP address, language and operating system for browser using this microservice. User can pass a string as a parameter, and it will check to see whether that string contains either a unix timestamp or a natural language date (example: January 1, 2016). If it does, it returns both the Unix timestamp and the natural language form of that date. If it does not contain a date or Unix timestamp, it returns null for those properties. This is a rougelike dungeon crawler game. Player have health, a level, and a weapon. Player can pick up a better weapon and health items. All the items and enemies on the map are arranged at random. Player can move throughout a map, discovering items. Player can move anywhere within the map's boundaries, but player can't move through an enemy until enemy has been beaten. When player beat an enemy, the enemy goes away and its level increases. When player fights an enemy, then they damages each other until one of them loses. Player do damage based off of its level and weapon. The enemy does damage based off of its level. Damage is somewhat random within a range. Player wins when boss is beaten. 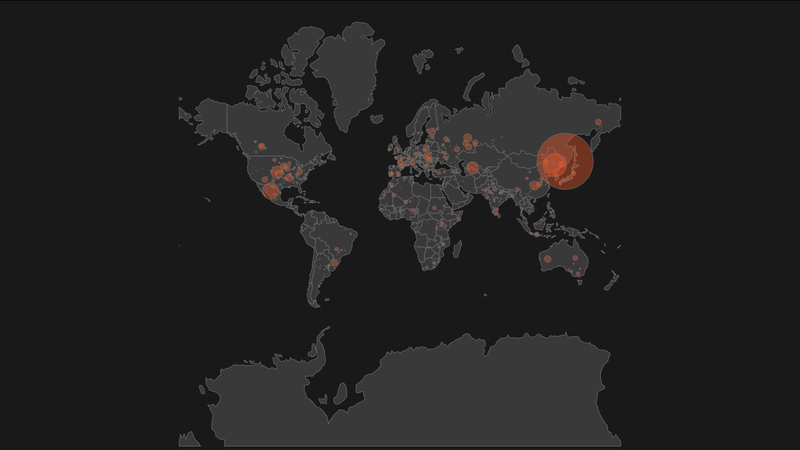 This web app visualizes meteorites data on world map. User can see where all meteorites landed on a world map and mouse over the meteorite's data point for additional data. Relative size of the meteorite can be told just by looking at the way it's represented on the map. This web app visualizes a force-directed graph that shows which countries share borders. User can see each country's flag on its node. 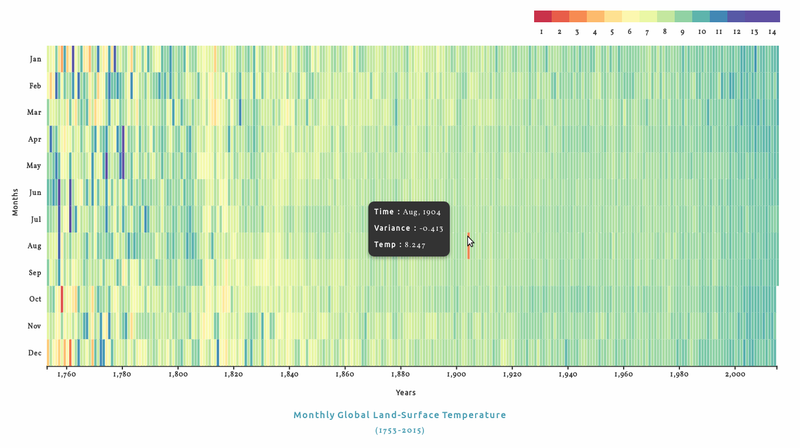 This web app visualizes data with heat-map graph. User can view a heat map with data represented both on the Y and X axis. Each cell is colored based its relationship to other data. User can mouse over a cell in the heat map to get more exact information. This web app visualizes data with scatterplot chart. 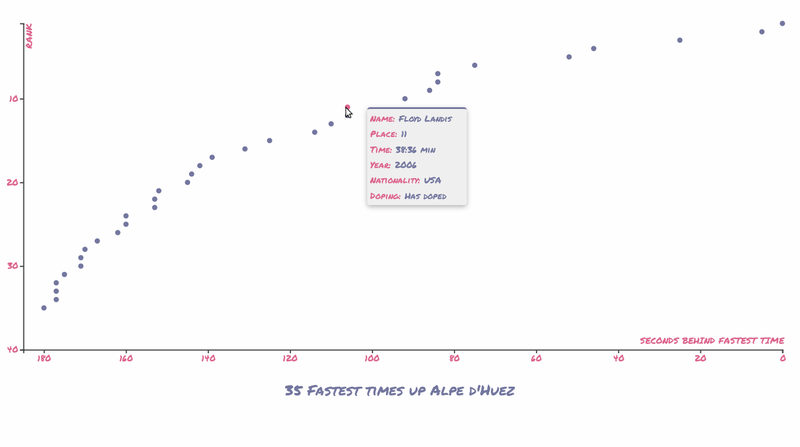 User can see world best bicycle racing scores and can mouse over a plot to see a tooltip with some additional details. 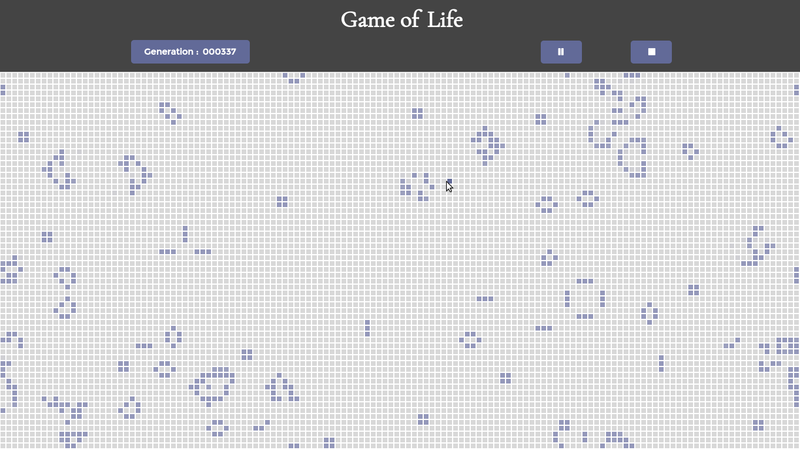 This app is react implementation of Conway's Game of Life. When user first arrive at the game, it will randomly generate a board and start playing. User can start, pause and clear the board. User can also see the number of generations that have passed by. 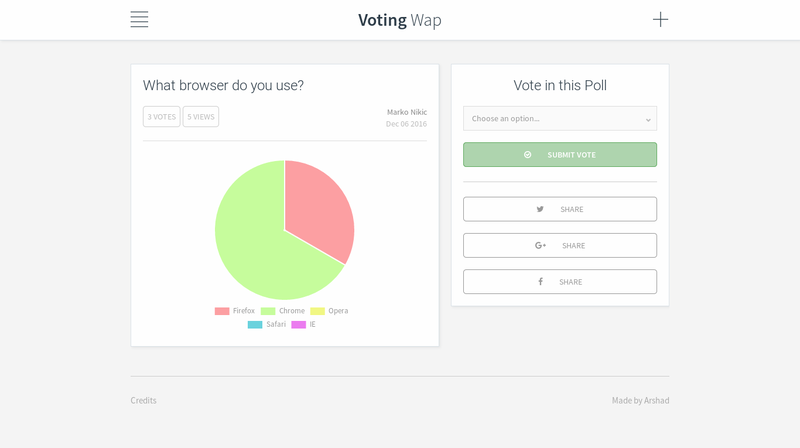 This web app visualizes data with bar chart. 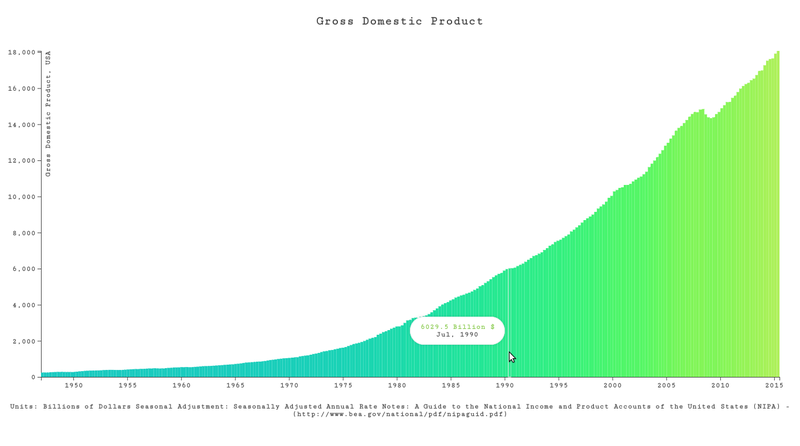 User can see US Gross Domestic Product by quarter, over time and can mouse over a bar and see a tooltip with the GDP amount and exact year and month that bar represents. 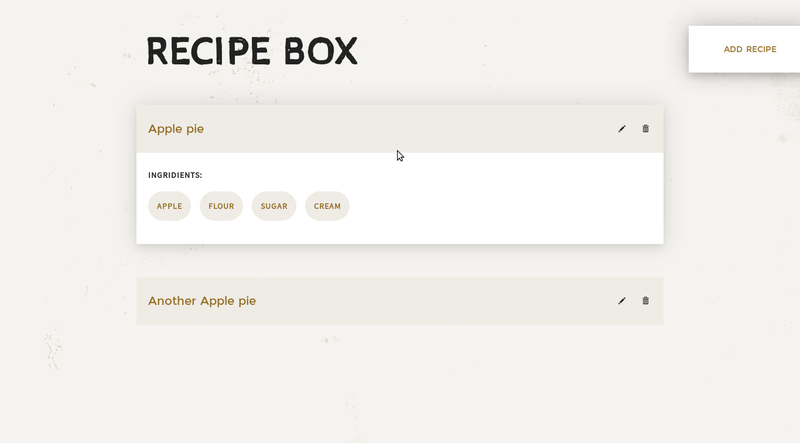 User can create, edit and delete recipes and see an index view where the names of all the recipes are visible. 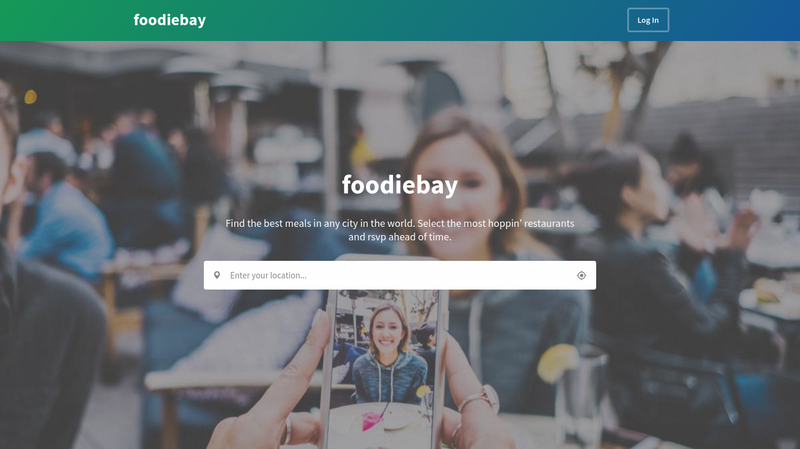 By clicking into any of those recipes, user can view it. All new recipes are saved in browser's local storage. If user refreshes the page, these recipes will still be there. 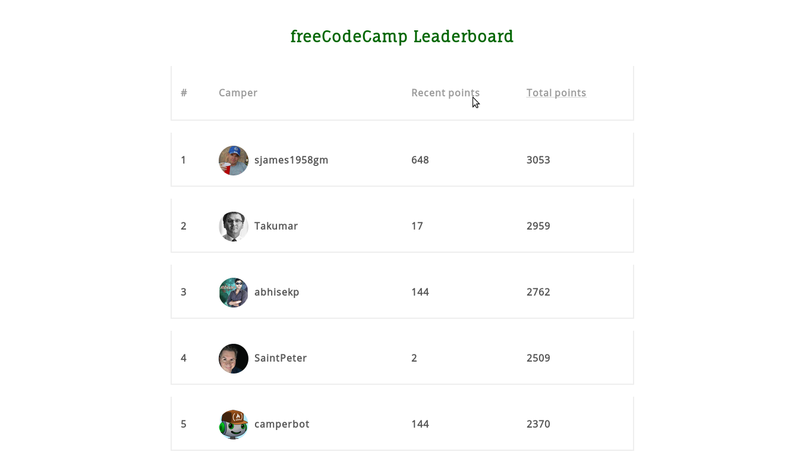 User can see a table of the Free Code Camp campers who've earned the most brownie points in the past 30 days as well as campers who've earned the most brownie points in all time. User can also toggle between these two list. 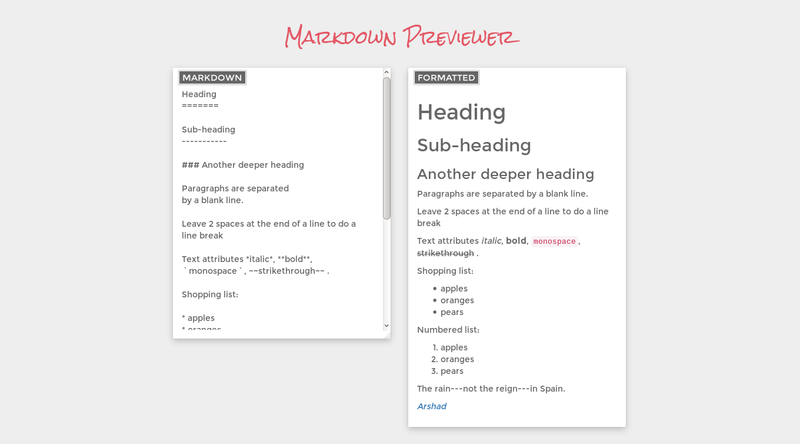 Markdown Previewer interprets github flavoured markdown into formatted text. User can type GitHub-flavored Markdown into a text area for which a preview of the output of the markdown will be displayed. 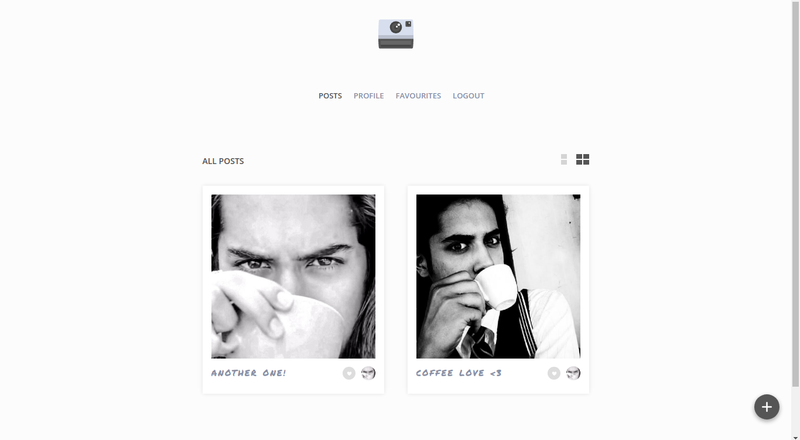 Output will be updated simultaneously as user type. Segmentation is used show a special version/variation of the user's webpage to a selected segment of users. Ideally, the user would enter the URL for that special version of his website on a web tool and then specify all the segments that he would want to show this version to. This UI module allows users to easily select and create a complex combination of visitor segments that they want to target. 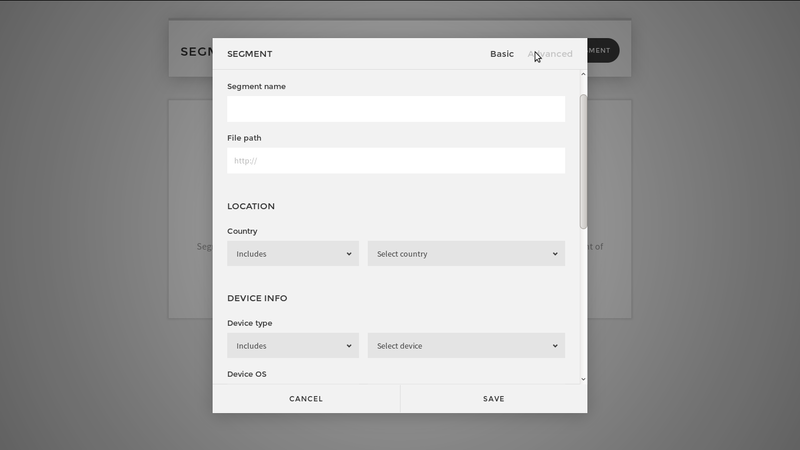 At the same time, it is not too much in the user's face by showing them all the segment fields open, if they don't want to target any specific segment (which is the default action). 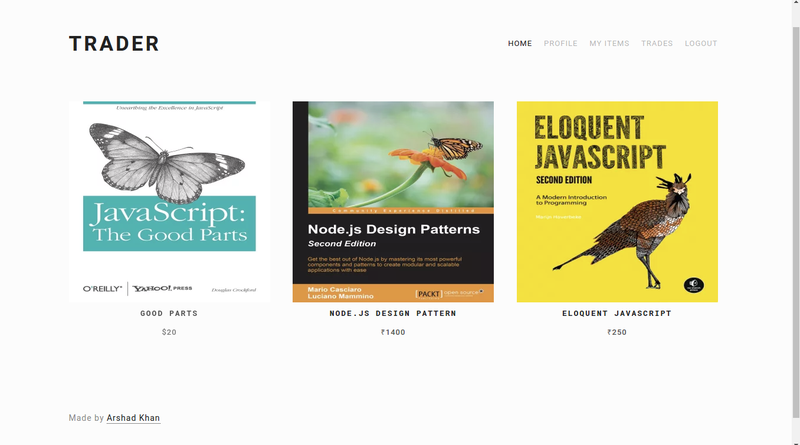 This UI assignment was given to me when I applied at Wingify for Front-end developer position. Random joke machine spits out random joke and giphy of Chuck Knorris. You can get next random quote and giphy by clicking a button. You can also tweet out the quote if you like. 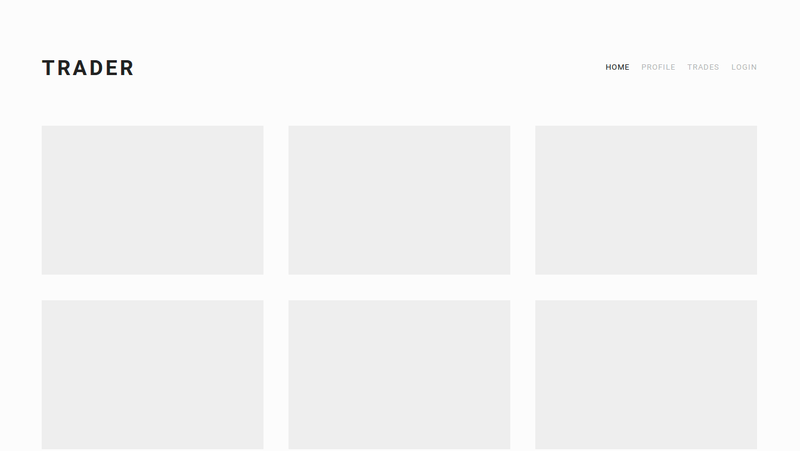 This is a web implementation of tic tac toe game (also known as Noughts and crosses or Xs and Os). It is a game for two players, X and O, who take turns marking the spaces in a 3×3 grid. The player who succeeds in placing three of their marks in a horizontal, vertical, or diagonal row wins the game. This webapp requires your current location and based on that location, it tells you the weather of your place. You can convert temperature into Celcius or Fahrenheit notation. 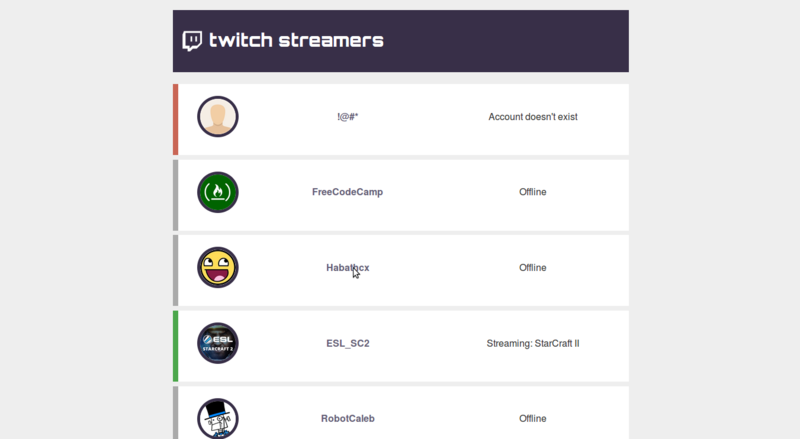 Twitch-tv app accesses the twitch-tv database and displays the current streaming user and their current stream. It also displays the users that are not online and other informations which tells account status of users. This is a web implementation of pomodoro clock which uses a timer to break down work into intervals, traditionally 25 minutes in length, separated by short breaks. These intervals are named pomodoros. 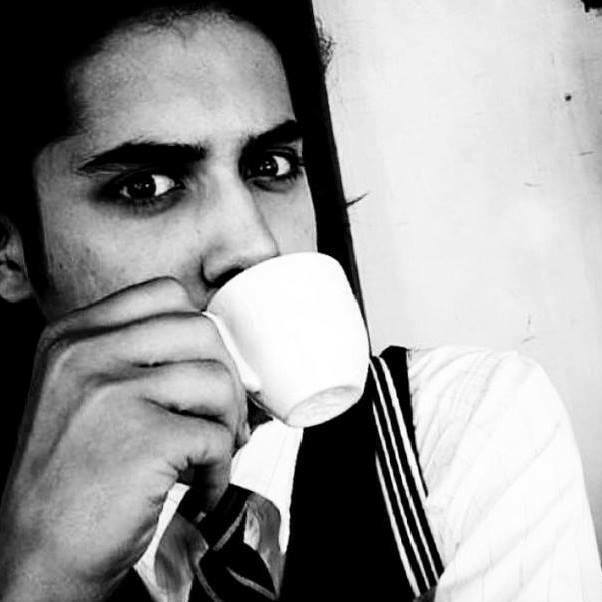 The method is based on the idea that frequent breaks can improve mental agility. You can set clock time as well as break time and reset the clock after starting it. 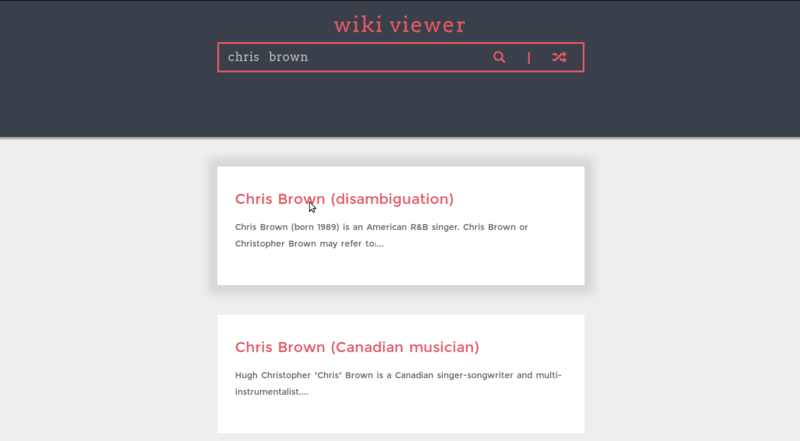 Wiki viewer gives you result for your search query. You can click a button to goto a random article. Only the top 10 results are shown for a particular query. In this game, the device has four colored buttons, each producing a particular tone when it is pressed or activated by the device. A round in the game consists of the device lighting up one or more buttons in a random order, after which the player must reproduce that order by pressing the buttons. As the game progresses, the number of buttons to be pressed increases. If user completes 20th level then he/she is declared winner.